The Republican Party on Tuesday formally anointed Mitt Romney as its nominee to wrest the presidency from Barack Obama in November elections. Romney, a former Governor of Massachusetts, needed 1,144 delegates to clinch the nomination at the Republican National Convention in Tampa, Florida. He won 2,061. 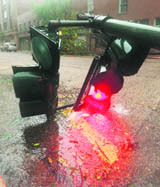 Hurricane Isaac drove water over the top of a levee on the outskirts of New Orleans on Wednesday, but the multibillion-dollar barriers built to protect the city itself after the 2005 Katrina disaster were not breached, officials said. The slow-moving but powerful Category 1 hurricane was felt along the Gulf Coast, threatening to flood towns in Mississippi, Alabama and Louisiana with storm surges of up to 12 feet and winds up to 130 kph. In a contradiction of the official version of Osama bin Laden's killing, a firsthand blow-by-blow account claims that the Al-Qaida leader was shot in the head by a SEAL bullet when he looked out of his bedroom door into the hallway, and not killed inside the room. The man who killed six Sikh worshippers at a US gurdwara before fatally shooting himself had a history of alcohol problems and underwent a noticeable personality change in the preceding year, according to an investigative report released yesterday. Building a universe from scratch that brims with galaxies resembling those around us is now possible on supercomputers for the first time, according to researchers. Our galaxy, the Milky Way, is a spiral galaxy with a broad disk and outstretched arms, as are many in our cosmic neighbourhood, such as Andromeda, the Pinwheel and the Whirlpool galaxies. The Republican Party on Tuesday formally anointed Mitt Romney as its nominee to wrest the presidency from Barack Obama in November elections. Romney, a former Governor of Massachusetts, needed 1,144 delegates to clinch the nomination at the Republican National Convention in Tampa, Florida. He won 2,061. South Carolina Governor Nikki Haley, the daughter of Sikh American immigrants, was among those who addressed the convention on Tuesday night. America's other Indian American governor, Bobby Jindal, who is also a Republican, skipped the convention to be in his home state of Louisiana, which was being battered by Hurricane Isaac. In Tampa, the highlight of the evening was the address by Romney's wife, Ann. She sought to humanise her husband whose biggest handicap in the campaign so far has been his inability to make a personal connection with most American voters. Ann Romney spoke affectionately of her husband as "this boy I met at a high school dance." She added: "His name is Mitt Romney and you really should get to know him." "Mitt doesn't like to talk about how he has helped others because he sees it as a privilege, not a political talking point," she added. As the Governor of the liberal northeastern state of Massachusetts, Romney's politics have not always been lockstep with the conservative wing of his party. Ann Romney acknowledged this fact, saying: "You may not agree with Mitt's positions on issues or his politics. Massachusetts is only 13 per cent Republican, so it's not like that's a shock." Romney, a multimillionaire, has been dogged by questions over his taxes. A new poll by the Pew Research Centre found that 58 per cent of Americans polled believe that the rich pay too little in taxes. More than six-in-ten Americans said the Republican Party favours the rich over the middle class and poor, and 71 per cent said they believe that if Romney is elected President his policies will favour the wealthy. Ann Romney painted the picture of the Romneys as a regular American family and her relationship with her husband as a "real marriage." "I read somewhere that Mitt and I have a 'storybook marriage,'" she said. "Well, in the storybooks I read, there were never long, long, rainy winter afternoons in a house with five boys screaming at once. And those storybooks never seemed to have chapters called [Multiple Sclerosis] or breast cancer." Ann Romney is a breast cancer survivor who has also battled MS.
"I can't tell you what will happen over the next four years. But I can only stand here tonight, as a wife, a mother, a grandmother, an American, and make you this solemn commitment: This man will not fail. This man will not let us down," she added to enthusiastic applause and chants of "Mitt! Mitt!" Ann Romney's speech was also focused on winning over women voters alienated by recent Republican policies and rhetoric. "It's the moms of this nation-single, married, widowed-who really hold this country together," she said. New Jersey Governor Chris Christie followed Ann Romney with the keynote address to the convention. Earlier, Haley in her speech aired her criticism of Obama in her address to the convention. "Slighting American ingenuity and innovation, that's what this President has meant to South Carolina. That's what this President has meant to this Governor. And that's why this Governor will not stop fighting until we send him home back to Chicago and send Mitt and Ann Romney to 1600 Pennsylvania Avenue," Haley said to wild applause. Romney will address the convention and accept the party's nomination on Thursday. His vice-presidential pick, Paul Ryan, and former Secretary of State Condoleezza Rice will address the convention on Wednesday. The Democratic Party holds its convention in Charlotte, North Carolina, next week, at which time Obama will pick up his party's nomination. Hurricane Isaac drove water over the top of a levee on the outskirts of New Orleans on Wednesday, but the multibillion-dollar barriers built to protect the city itself after the 2005 Katrina disaster were not breached, officials said. The slow-moving but powerful Category 1 hurricane was felt along the Gulf Coast, threatening to flood towns in Mississippi, Alabama and Louisiana with storm surges of up to 12 feet and winds up to 130 kph. "All of the levees are holding and are very strong," New Orleans Mayor Mitchell Landrieu told local radio. Emergency management officials in low-lying Plaquemines Parish reported the overtopping of an 8-foot high levee between the Braithwaite and White Ditch districts southeast of New Orleans. Plaquemines Parish President Billy Nungesser said about 2,000 residents of the area had been ordered to evacuate but only about half were confirmed to have gotten out before Isaac made landfall late on Tuesday. Plaquemines Parish, which stretches southeast from New Orleans, is cut in two lengthwise by the Mississippi River as it flows to the Gulf of Mexico. Much of it lies outside the greater New Orleans levee system, and construction projects to bolster protection are not yet complete. "The sheriff's deputies are over there but all the roads are unpassable ... We don't know if some people are left behind and now we can't get there and there is no way we can operate a boat or an air boat in these winds," Nungesser said. A firsthand blow-by-blow account claims that the Al-Qaida leader was shot in the head by a SEAL bullet when he looked out of his bedroom door into the hallway, and not killed inside the room. 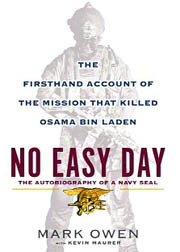 The new version in the book 'No Easy Day: The Firsthand Account of the Mission That Killed Osama bin Laden' put out by a former Navy SEAL, who was part of the team which eliminated Osama in Abbottabad in Pakistan last year, debunks the official version of the White House. British newspaper Daily Mail reported that according to the account written under the pseudonym Mark Owen, bin Laden was hit in the head by a SEAL when he looked out of his bedroom door into the top-floor hallway while other operators were rushing up a narrow stairwell in his direction. 'Owen' writes in the book that the mission was quite unlike the popular version of what really went on at the house in Abbottabad. He says a member of the elite squad saw the terror leader as he ducked into his bedroom, and the soldiers, who were climbing stairs to the third floor, followed. "We were less than five steps from getting to the top when I heard suppressed shots. BOP. BOP. I couldn't tell from my position if the rounds hit the target or not. The man disappeared into the dark room," he writes. The report said Wade Michael Page's sister told investigators he had a bloated appearance that made her wonder if he had been drinking recently. She also said she noticed Page become more intense over the past year, as if he had lost his sense of humour. Page opened fire August 5 before a service was to start at the Sikh gurdwara of Wisconsin. He killed six persons and wounded four before he was shot in the abdomen during a firefight with the police. He died after he shot himself in the head. The Milwaukee County medical examiner's office ruled his death a suicide. Spiral galaxies are common, but past computer models that aimed to accurately simulate the birth and evolution of the universe over billions of years had trouble creating them. Instead, they often generated lots of blobby galaxies clumped into balls.